Pictures from the recent earthquake in Haiti have been heartbreaking. I saw some different kinds of pictures from Haiti today. These were heart warming pictures. Those of of Sikhs embracing Haitians, Sikhs serving hot food to people in Haiti. I was ecstatically surprised, and filled with pleasure and pride seeing the following: United Sikhs Haiti News. And the scale is fantastic -- the United Sikhs is serving langar to 5000 needy people in Haiti. Kudos! In times of fantastic ecstasy like this I am reminded of a raag that I was introduced to very early: Raag Malkauns. A couple of classics that defined Malkauns to me include Mohd. Rafi's Man Tarpat Hari Darshan Ko Aaj. and Bismillah Khan's Malkauns on Shehnai, a ubiquitous teen taal gat heard often in the background in old hindi film marriage scenes. 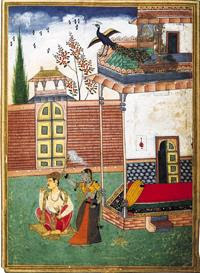 In the raagmala paintings depicting Malkauns (on the left), Shri Malav (Gandharva king) enjoys all the pleasures of his golden seat, relaxes while a maid fans him, and consumes a flavorful paan. An enjoyable experience I am sure. It is well known that Guru Gobind Singh ji was an accomplished musician. Although the Malkauns vaar has been deleted from the Dasam Granth, and the only place it occurs in the Guru Granth Sahib is the raagmala, it is widely believed by musicians that Guru Gobind Singh used to sing Malkauns himself. Several musicians use Malkauns to compose Dasam Granth compositions. It seems apt, therefore, on the occasion of the celebration of Guru Gobind Singh ji's birthday last month, four shabads were sung in Malkauns: (Gurmat Sangeet Darbar, Dec 19, 2009). My favorite renditions in this program are So Dar Keha by Guneet Kaur ji in Jhap taal and Jai Jai Jag Kaaran by Bhai Davinder Pratap Singh in Ek taal. In "So Dar Keha" Guru Nanak Dev ji asks (Pauri 27 of Jap ji), "What is that Place like, what is the House like, where that Lord resides? (And where) numerous Sound-currents vibrate simultaneously? And where musicians sing many melodious Raagas?" For me, today that place is Haiti where United Sikhs are serving langar sharing the luxury of hot food that king Malav would have also enjoyed on his golden seat. I still hope they have some divine singers like Guneet Kaur singing So Dar; if not, I hope they have some audio equipment playing kirtan when the langar is served. That Malkauns would be divine.